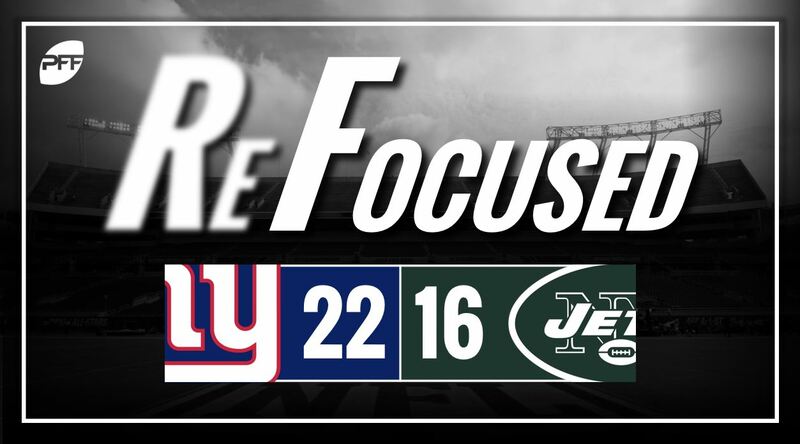 The New York Giants defeated the New York Jets on Friday night, 22-16, continuing the third full week of preseason action in the NFL. Eli Manning had a solid night. While the Giants worked a lot of underneath routes, Manning impressed when he took shots downfield. His best throw of the night came midway through the second quarter when he placed a pass just over Jets cornerback Buster Skrine into the hands of Sterling Shepard on a go route. Wayne Gallman continued to stake his claim to be the No. 2 back for the Giants. He showed impressive vision and was decisive with his cuts. Kerry Wynn stood out for the Giants’ defense on a number of occasions, which included at least a sack, a hit and a couple tackles for loss in run defense. Josh Mauro also had a nice night rushing the quarterback. He had one sack on a perfectly executed T-E stunt and was around the quarterback a couple other times, as well. Sam Darnold didn’t really make any big mistakes, but it was also a pretty underwhelming performance on a night where the Jets’ offense struggled to move the ball consistently. The Jets’ backup offensive line didn’t make it easy for quarterback Teddy Bridgewater at times, but it was nice to see him stand in the pocket with pressure in his face and make some throws downfield, even if they weren’t always in the perfect location. The Giants’ starting offensive line didn’t have much of an answer for Jets interior defender Leonard Williams. He made a handful of good plays against the run and added a hit as a pass rusher. The Jets struggled to stop the pass for most of the evening. They were constantly beaten by crossing routes, and they gave up too many big plays downfield. Giants: Manning was the reason the Giants came away with the win. Not only did he hit some big throws, but he was also responsible with the ball. While the offense was forced to settle for field goals, it showed promise without its top two weapons in running back Saquon Barkley and wide receiver Odell Beckham Jr. Jets: The key to the game for the Jets was their offensive line, but not for the right reasons. They didn’t get much movement nor seals in the run game, and on longer developing pass-plays, the front five struggled to handle stunts by the Giants’ defensive line. This somewhat limited their best plays to the quick passing game.